Squash House Quilts: Blog Book Tour - Uncommonly Corduroy! Blog Book Tour - Uncommonly Corduroy! Welcome to Day 3 of the Uncommonly Corduroy Blog Book Tour! Comments are now closed. Come back tomorrow for the announcement of the winner of the E-book! Stephanie of Loft Creations has published her first book called "Uncommonly Corduroy". Many of you know that I am one of her team of "Supreme's" who test her pattern instructions prior to being published. We make sure there are no errors so when you take it out of the package and begin sewing, you'll have a smooth and flawless finish! "Images from Uncommonly Corduroy by Stephanie Dunphy, Martingale, 2014; used by permission. Photos by Brent Kane. All rights reserved." 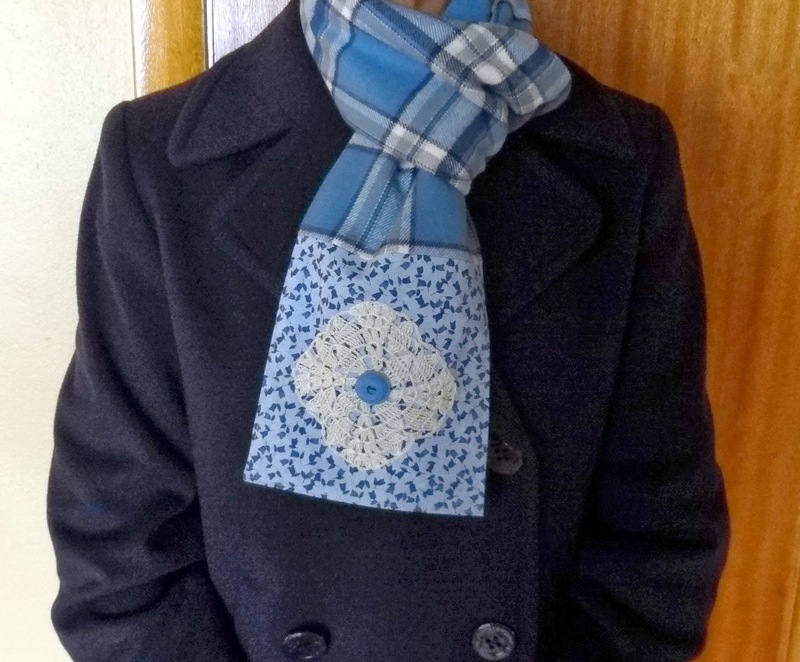 The first project I tested was the "California Girl Scarf". This is the image from the book. And here is my version. Complete with vintage doily and button! I didn't use corduroy on my version - any of the projects in the book can be made from regular cotton! 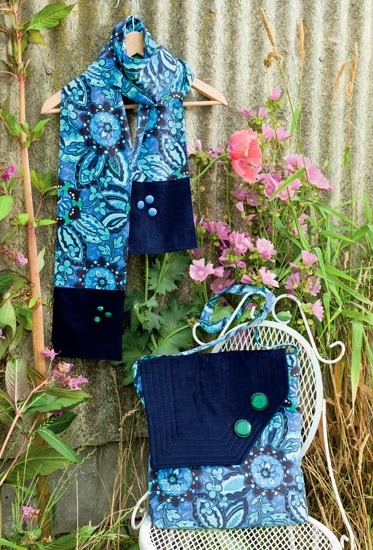 The scarf makes up in a jiffy and you can embellish it to your heart's content! 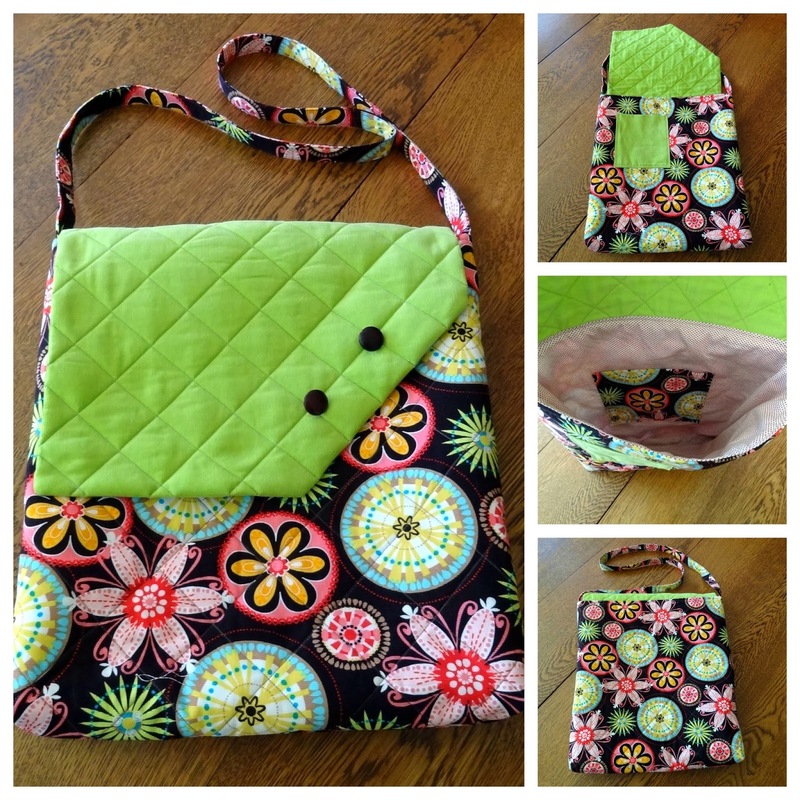 The next project is the "California Girl Bag". You see the image from the book up above along with the scarf. Here is my version. Except for the lining, I used corduroy for the entire bag. I have to say how much I love working with 21-wale corduroy! It's soft, supple and quilts so easily! The needle goes through the fabric like butter! The next project I Supreme tested was the "Abby on the Go Bag". Abby is Stephanie's wonderful dog who also makes an appearance in the book! Here is the image from the book. Here is my version! This is a large bag - perfect for carrying any doggie or kitty essentials you might need! I made this bag with a combination of corduroy and home dec fabric. Stephanie's bag patterns are very easy to make and she is consistent in her instructions. 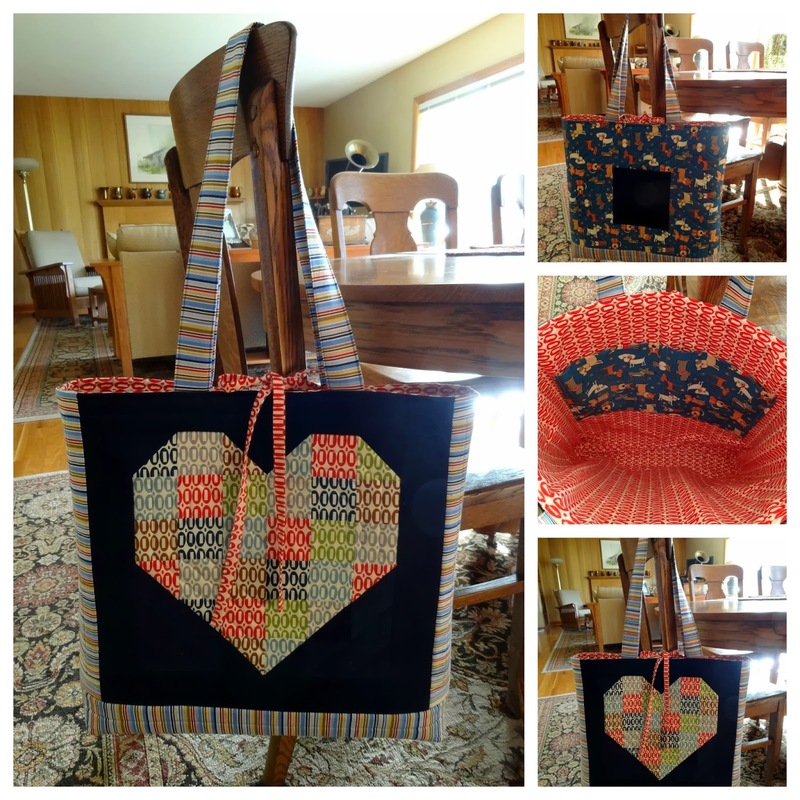 Once you make one bag, each pattern thereafter is a breeze! The final project I tested for the book is "I Heart Dresdens". This is the image from the book. Here is my version! There was a bit of a rush on making this bag, so I used some Sweetwater I've had on hand just waiting for the right project. You can let your imagination run wild with this pattern - any fabrics, cotton or corduroy, home dec will make a terrific bag! Notice the handle where I made sure Paducah showed? I plan to carry this to the quilt show in Paducah - hopefully soon! If you would like to win an electronic version of Uncommonly Corduroy, leave a comment on this post telling me if you've ever made a bag or quilt using corduroy, and if not, which would you try first? Stephanie's book is available from Martingale or Amazon. If you would like a personalized copy you can get it directly from Stephanie HERE, the link is on her sidebar. Below is the schedule for all the stops on the Book Tour. Each participant is giving away a free e-copy of the book and showing their fabulous projects, too! Thanks for joining me on the Tour! Candace, your finished projects are gorgeous! I especially love the California bag and the Dresden bag. Your work is so well done! I have never sewn with corduroy, but I love the fact that these patterns can be made with other fabrics too! I love your versions of the patterns. As soon as I can get some of that baby corduroy, I will try one of the quilt patterns in Stephanie's book. Next Friday is my turn to show what I tested! I like the California girl bag. It looks very cute and would make a good go to bag. Thank you for sharing. I have never made anything with corduroy because nap scares me. Not having to worry about it in a quilt would be great. I love your scarf - the doily is so pretty. I made a red corduroy bag years ago for my sister. I'd love to use corduroy creatively again. I've never made anything from corduroy except apparel but I love the Dresden bag! I have never made a corduroy quilt but I would love to give a try!! I love the tote bags in the book and I think I would start with making with one of those. I have never made anything with corduroy. I think I would try the Dresden bag. It looks large enough to carry to any occasion where I would NEED a large bag to fill up! !Thank you for your review! I have not, as yet, made anything from the new corduroy, but after seeing all your beautiful projects, will definitely do so. I have lots of mini doilies from crafting I did in another life and think they can now be put to good use. Your projects are all fabulous. The corduroy is really great for sewing and feels heavenly. The last time I worked with corduroy was a jumper for my daughter, 30 years ago. I really like the bags. Very nice. That tiny little Dresden block would be great done over and over in a quilt. About thirty years ago I made a quilt for my son using a couple of fine wale corduroys. I was so sure I was breaking all the quilting rules! I love your versions of Commonly Corduroy projects. We have snow, too, as we live in the Rocky Mountains. Plenty of time to work on such fun projects. Right now I am eyeing "California Poppies" in anticipation of spring. I love corduroy (flannel, too)and I'll share a secret - I'm addicted to the feel. I've done a lot of craft sewing with corduroy, and some quilting projects. My plan was originally to make a quilt, for me for a change :) After seeing your dresden plate bag I may have changes my mind. Perhaps I deserve a new bag, too? I've health problems the last year or so and haven't done much fabric shopping. (I know horrors! with a <>) So I totally missed that Sweetwater fabric, which I totally love. It's wonderful in that bag! I gotta get me some, hope it's still available. Since I live in Paducah it would be perfect for the bag as well as all kind of other things. The various locations listed would also be great for friends, perhaps fussy cut for a special Christmas ornament? Thanks for sharing and inspiring! Hoping I'm a lucky winner. Just love your versions of these projects. 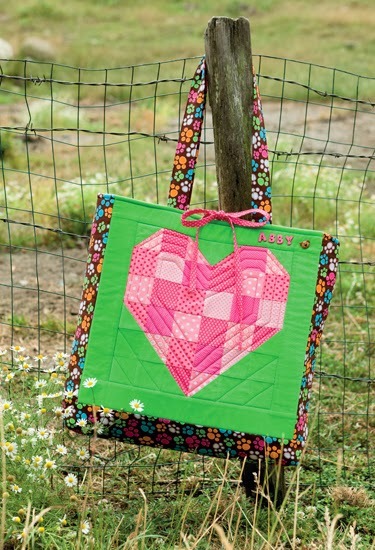 My favorite is the " I Heart Dresdens" in Sweetwater fabric ! Adorable ! oooh, love the scarf! And I like you version of the bag. So pretty. I use corduroy a lot! 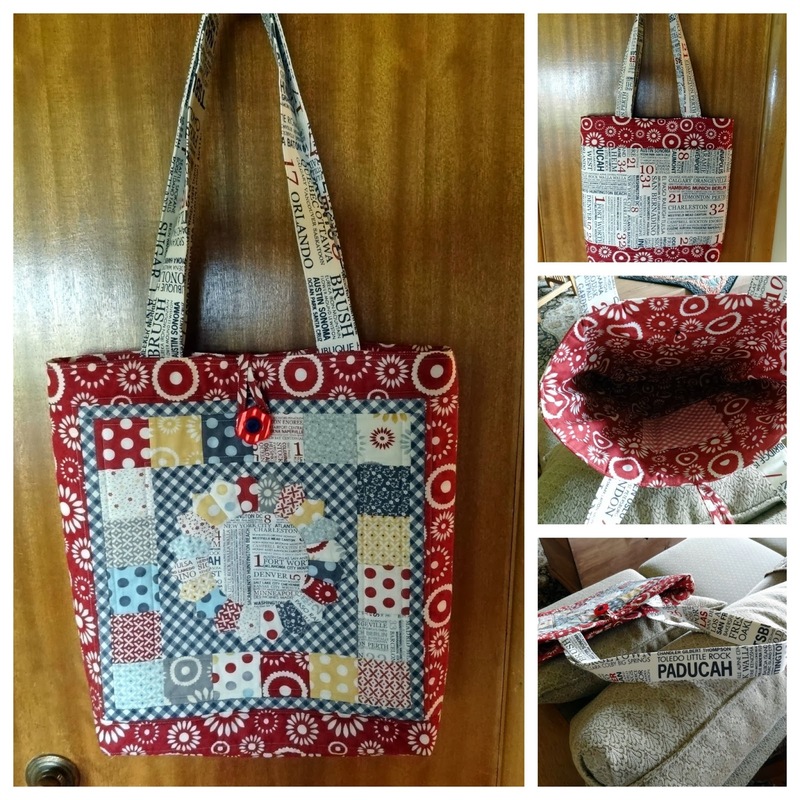 Its great for bags and so easy to sew with. I have not made anything with corduroy but I would make a baby quilt for a friend! She is expecting a little boy and I think this would be great and durable! Candace, what lovely projects you made while testing the projects for Stephanie's book. I really like your interpretation of the scarf pattern and all three bags are gorgeous. I've never done a Dresden but can't wait to try as the instructions in the book make everything look so simple. Please don't enter me in the draw. I have my own precious hard copy of the book and I have to say I LOVE it. I grew up with corduroy, and I'm so happy to see it making a comeback - the book looks thrilling! I have not sewn with corduroy, but I am thinking that I need a new bag and corduroy would be the perfect weight for it so I might just give it a try. Now picking a bag from the ones you showed here would be hard. I love them all, but especially the Dresden one because I love Dresdens. I've not made a corduroy bag, but used to make a lot of clothes with it. I'd try the Abby bag first. Just the right size for what I need. Thanks for the giveaway. Oh I love that California girl bag, I have no used corduroy before, so that would be a fun project to try it out with!! I have made a quilt with corduroy, many moons ago. I would like to try one of the bags. Thanks for the chance to win. I've never made a quilt using corduroy but am anxious to get some of the wale corduroy for a jumper for my granddaughter. I also want to make the purse with the Dresden and that scarf too. Both are great projects. Never used corduroy but would love to try! Would try a kids quilt first. WOW! you did a lot of test patterns. All delightful. I think I need to make one of the scarfs. Yes, I have made a couple quilts with pinwale corduroy. I used the corduroy for sashing and border. It turned out really nice, but it was a little heavier that regular cotton. I have only used corduroy for garment sewing. I think I would make the California Girl bag because it is just the right size for when you don't want to carry a big bag. I haven't done any sewing with Corduroy - pants or quilts. Not sure which project to try first. I've sewn with corduroy to make clothing many years ago. 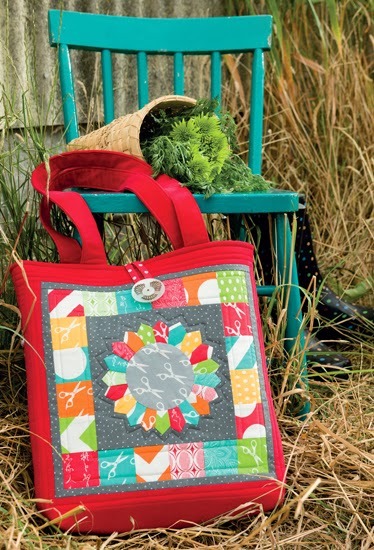 It would be fun to try a bag and then move on to a quilt! I just made a purse for my daughter using corduroy and would love to make one for me. Thanks for a chance to win the e book! I haven't used corduroy in quilting yet but I do love the Abby on the go bag. That would be my first project. Thanks for the giveaway. Very nice projects. I'm going to have to try this corduroy stuff....it's not just for "one-man-band-pants" anymore! No I haven't, but it sounds like fun! Thanks! I have not made a bag from corduroy, but I would love to try! I am anxious to make the bag with Dresden. Thanks for the giveaway. I have not worked with corduroy. I had no idea so many prints existed. I would make the bag first. I love seeing both of your versions of the same bag, it spurs the imagination. And I am so ready to sew/quilt with corduroy. Love all of your projects from this fun book . Thanks for the chance to win a copy . The projects are awesome. I've never sewn with corduroy and I think I would make a tote first. I have never made a bag with corduroy but have sewed other items with it. I really love the California bag. So cute! I have finally been inticed to make a bag. Your creations at lovely. I'd love to try making a quilt with corduroy -- especially after hearing it stitches like butter! I'll be looking for 21 wale when I next hit up the fabric shops. I haven't tried yet but I'd like to. A bag would be a good start! I made a corduroy bag a few years ago - I used 21-wale corduroy for both the bag and the lining, and finished it with a cross-stitched panel with the words "When the going gets tough, the tough go shopping". It's gone shopping with it a number of times! I just love all the projects I am seeing from this book, but oh my, the bags are just gorgeous. I think i would try a bag first. But would still want to make a quilt, it would be so warm made from corduroy. Thanks for letting me see these in person... your work is just beautiful! Your stacks of 400+ blocks were amazing! I'm hoping to finish ONE pillow by next week! Thanks for the chance to win this book! Haven't tried working with corduroy yet! Your photo projects look absolutely wonderful! I love the feel of corduroy, but have never used it in any project. Thanks for sharing your projects and for sponsoring the wonderful giveaway. I have never used corduroy for a bag or quilt, but I will sure be trying it in the future! Thanks for the giveaway. Please do not enter me in your giveaway (I have my owned signed copy of the book...woohoo). I just wanted to tell you that I LOVE your versions of all of those projects. I've chosen two bags to make, I haven't gotten to the quilts.....yet. Yes, as a sewer of a whole lot of things, I have made a bag out of corduroy - perhaps even two. I would love to make another one out of some bright pinwale corduroy. I have sewn corduroy, but not in anything except clothing. But I would love to make the Dresden bag, so very cute! I love how all your versions turned out. I already have some corduroy that I had planned to use on a tote....I hope that I will be able to win the eBook....thanks for the chance. What gorgeous projects you completed! That new corduroy fabric sounds so interesting. I'd love to own that book. Thanks for the opportunity. The Stack Grows and a Whole Lot of Snow!